Geologists in Oman have found a type of rock that can be used to soak up huge quantities of carbon dioxide. The rock, known as peridotite, lies in a layer of rock at or just under the surface of a stretch of Omani desert the size of Massachusetts. It harbors the potential to clean up 4 billion tons of CO2 annually by just exposing it to CO2 infused hot water. To put that in context; global annual carbon emissions are 30 billion tons. The rock apparently reacts to CO2 in a much higher degree than thought previously. Plans are now to inject captured CO2 at the peridotite source at far less expense than processing the rock at energy plants, something that had been suggested previously. The scientists made their case after discovering conveniently exposed peridotite and subjecting it to the standard carbon dating method. That led to the discovery that the stuff absorbs 10,000 to 100,000 tons of carbon every year – far more than any scientist had dared dream before. According to their article in the Proceedings of the National Academy of Sciences, peridotite usually resides some 20 kilometers or more down below the earth’s surface. In places like Oman, it’s been pushed to the surface and 5 kilometers below it due to subterranean collision of tectonic plates. The rock could afford us with “a low-cost, safe and permanent method to capture and store atmospheric CO2,” according to geologist Peter Kelemen, who co-authored the article. 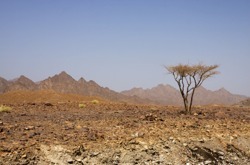 He and his fellow scientists from Columbia University’s Lamont-Doherty Earth Observatory spent a lot of time at the Omani desert, an expanse the size of Massachusetts of largely bare, exposed peridotite. The area’s surface reveals terraces and veins as well as different shapes of white carbonate minerals. These came into existence in more recent times due to the rock’s reaction to CO2-infused air or water. Underground, the geologists found way more carbonates ready to soak up CO2. Previously scientists had erroneously assumed that the subterranean rock was formed by a process unconnected to the atmosphere and that the veins of peridotite were almost as old as the 96-million-year-old rock encompassing it. But Kelemen and his colleagues dated the underground carbonate mineral veins back to 26,000 years on average which means that they actively absorbing carbon at way higher rates than thought. Similarly large exposures of peridotite reach the surface in Papua New Guinea, in Greece and in the former Yugoslavia. The US and many other countries also have small deposits. All is very good news but the best news by far is that it’s relatively easy to dispose of CO2 in this young rock. Engineers simply have to drill a hole and inject heated water containing pressurized levels of CO2 in it. This way, the natural carbon scrubbing process could be sped up by as much as 100,000 times. The naturally generated heat would further accelerate the chemical reaction because large portions of rock would be fractured which would create more scope for CO2 reactions. Plus, the further down the process takes place, the higher the temperature due to heat generated by the earth itself. It’s one of the best carbon traps discoverd thus far. One slight side effect is that the cracking and expansion of the underground substances would generate micro-earthquakes. Yet Kelemen reassures that this activity would not even be perceptible to humans. Already Petroleum Development Oman, the state oil company, is interested in a pilot program.